sorry for the lack of posts here lately, i just really haven't been up to too much crafty stuff in the last couple of weeks, too busy being itchy and consumed with house hunting. 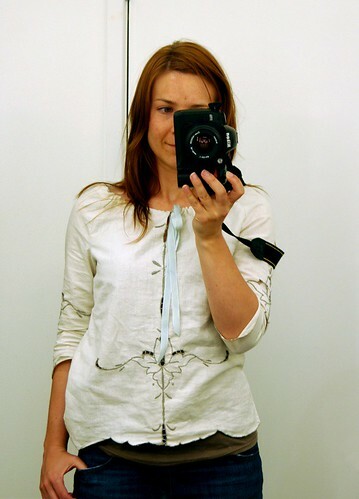 however, the amazing weather we had here in melbourne last week really made me realize that my summer wardrobe is meager at best so friday night i made my first garment sewing attempt - a little tunic type top, made from a vintage embroidered linen tablecloth that i picked up for $3.99 at an op shop. edited to add: sorry about the crappy photo, by the way. my little work buddies are all out on a shoot so i had to resort to the classic self portrait which, because of the awkward pose, doesn't even make the top look too good. i'll try to get some pics of the shirt flat this week and add them in. The top is very cute, Les! Once again, how do I place an order? Keep up the excellent crafty work ... oh, and I will be e-mailing you about the skin stuff, as I have some suggestions on that end too! that is an amazingly beautiful top! Actually, I think it's a very nice photo. Nice job on the top. wow, "anonymous", two compliments and one insult all wrapped up. maybe you're not familiar with the characteristics of linen? but no, you're right, i probably should carry an iron with me AT WORK and give my clothes a quick run over at mid-day. sheesh. to appease you, i promise to give it a press before i get around to taking the flat pics. I quite like the slight wrinkly quality of the shirt, I wouldn't iron linen unless it was a tablecloth or napkins. I like the ribbon also. Wow! That shirt is amazing! Had you not said it was handmade I would have assumed it came from Anthropologie or another such fab store. Thanks for sharing! "Doesn't even make the top look too good"
...are you kidding. That top is gorgeous!! Great job! This shirt is great; awesome job. That top looks gorgeous. How very clever of you.